From The New York Sun. May 6, 2005. The directorial career of Michael Powell, a major retrospective of whose films begins today at the Walter Reade Theater at Lincoln Center, spanned half a century, but his best and most characteristic movies date from the World War II years and are essentially war propaganda. Yet there has never been such propaganda before or since — largely because it doesn't look like propaganda. 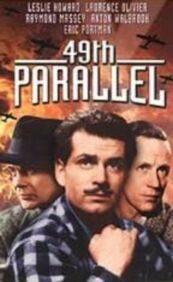 In 1941's "49th Parallel" (May 21 and 22), a German submarine crew stranded in the Canadian north tries to make its way to the then-neutral United States. Only the leader (Eric Portman) is a committed Nazi, and Powell was criticized for making the rest of the Germans look too human. One of them, played by Niall MacGinnis, even decides to stay in Canada in a community of Hutterite Germans. He is shot for desertion. Here neither the bad nor the good guys are mere caricatures. Leslie Howard's gentle Canadian author and outdoorsman, who just happens to have a Picasso and a Matisse in his tent in the Rockies, comes close when calmly discussing art and literature with the Nazi, who despises his apparent softness and destroys his "degenerate" artworks. But Howard shows he's no wimp, striking a series of blows: "That's for Picasso," he says, "that's for Matisse; that's for Mann, and that's for me!" This was early in Powell's wartime career, and rather a crude reaching for cultural contrast that he didn't need later on. By the end of the war his propaganda was much more subtle. Unlike the Nazi or the Soviet varieties, or even America's aggressive promotion of democracy in Frank Capra's "Why We Fight," he has no ideology, not even the ideology of art, and so doesn't overpromise. There is no utopia to fight for. Or rather, a sort of utopia already exists. It is England with its storied past and its gentle, decent, humorous people. Unlike the more political utopias it is not perfect. Some adjustments will have to be made as a result of the war. But this only makes it more believable, and more cherishable. 1944's "A Canterbury Tale" (May 14 and 15), which was written by his longtime collaborator and screenwriter, the Hungarian Jewish emigre Emeric Pressburger, begins with scenes from a medieval pilgrimage to Canterbury — Powell's hometown. As one of the aristocratic pilgrims squints up at the sky at his hawk, the bird in the distance transforms into a warplane, the falconer into a British soldier looking up with an expression of grim determination. For all the change in 600 years, we are meant to see it as still Chaucer's England. 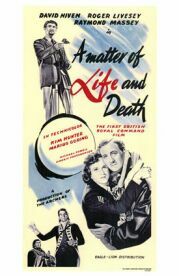 By this time the war is in the background, and the film is about two soldiers on leave — one British (Dennis Price) and one American (Sergeant John Sweet) — and a land girl (Sheila Sim), and a bit of semi-comic sleuthing during wartime that eventually involves them in a sort of pilgrimage of their own, and a modern-day form of blessing on each of them. At one point the village magistrate — Portman again, transformed from Nazi to keeper of the flame of old England — gently questions the girl about her relationship with her fiance, who she believes has recently been killed in action. He was from a good family, she tells him, and his father didn't approve of his marrying a shop girl like herself. "'Good family'? 'Shop girl'? Those are rather dilapidated phrases for wartime," says the magistrate. 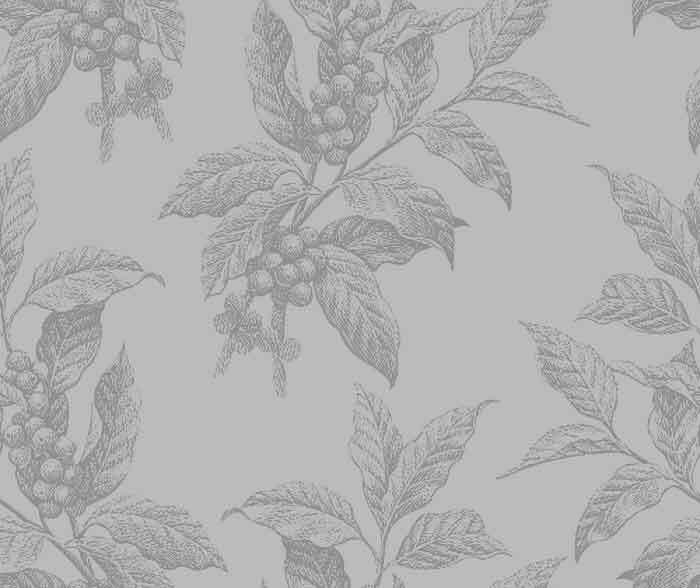 "Not for Geoffrey's father," she replies. "It would have taken an earthquake." It was a common perception at the time. In their next film, 1945's "I Know Where I'm Going!" (May 13, 14, and 30), the much-older man whom the heroine, Joan Webster (Wendy Hiller) is supposed to marry, is pretty obviously a war profiteer, one to whom the handsome young Scottish laird, played by Roger Livesey, rents his property. The laird is a naval officer, one of those for whom and by whom the war was fought. When Joan makes the inevitable decision to abandon the rich man to whom she has aspired all her life and throw in her lot with the impecunious laird, it is meant to be seen as the hopeful direction in which postwar Britain itself is going. Like "A Canterbury Tale" it was part of Powell and Pressburger's "crusade against materialism" and it foreshadowed Britain's postwar turn to socialism. 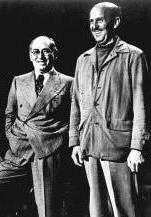 The two were probably describing themselves when they had David Niven's gallant airman in 1946's "A Matter of Life and Death" (May 13 and 15) describe himself as "Conservative by nature, Labour by experience." Like "A Canterbury Tale," this film has a supernatural element and stresses (reportedly at the request of the postwar government) the ties between Britain and America. With 1943's "The Life and Death of Colonel Blimp" (May 13 and 15) this film is probably the greatest of their wartime collaborations. The latter involves a harder-edged criticism of the pre-war class system, but even there, the schooling of the hero, again played by the marvelous Livesey, in the irrelevance of his Edwardian attitudes to the new world which the war was bringing into existence, was not without tenderness and affection both for himself and for that now-dead past. Powell later went on to make more famous films like 1948's "The Red Shoes" (May 6, 8, and 29) and 1951's "Tales of Hoffmann" (May 6 and 8) with Pressburger and even, on his own, an eerie forecast of a postmodern thriller, 1960's "Peeping Tom" (May 6, 7, and 29), which was so shocking in its time that it all but ended his career. But the wartime Eden he discovered in England's green and pleasant land might be his most lasting contribution to the cinema.